I am in the middle of a visit to Norway, at the invitation of the Sola branch of the Norwegian Education Union 'Utdanningsforbundet', the main teachers' union, which has around 157,000 members nationally. The trip has proved an invaluable opportunity to exchange experiences and build international solidarity between teachers who both face significant threats. I hope that the report below accurately presents the situation facing our Norwegian colleagues - but I hope that they will alert me if anything is inaccurate! 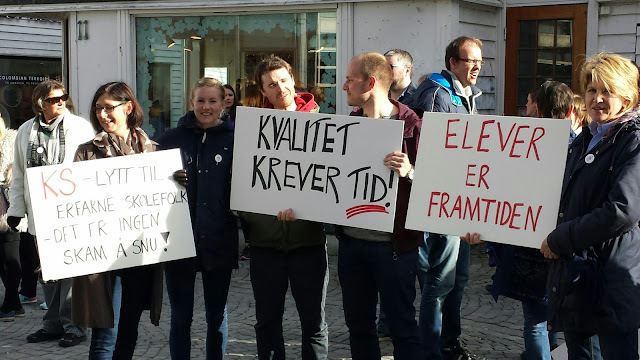 On the one hand, I have been able to warn Norwegian teachers about the disastrous effects of years of attacks on teachers' conditions in England, part of a broader attack on locally accountable comprehensive education. On the other hand, I have been privileged to be able to visit Norwegian schools, and to hear from teachers about the threats that they face themselves. 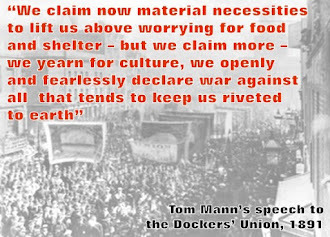 It seems to me that they face a combination of threats bringing together attacks that were introduced more gradually in Britain - such as Local Management of Schools, the loss of Negotiating Rights and the intensification of teachers' workload to the unbearable levels that are driving so many teachers out of the profession today. 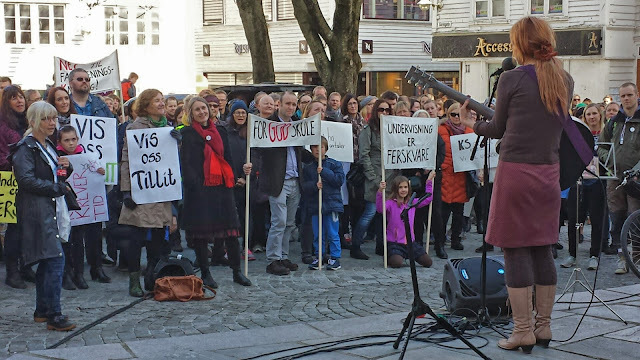 Up until now, Norwegian teachers have retained national negotiating rights with the Local Authority employers' organisation, allowing national agreements to be drawn up over pay and working conditions. 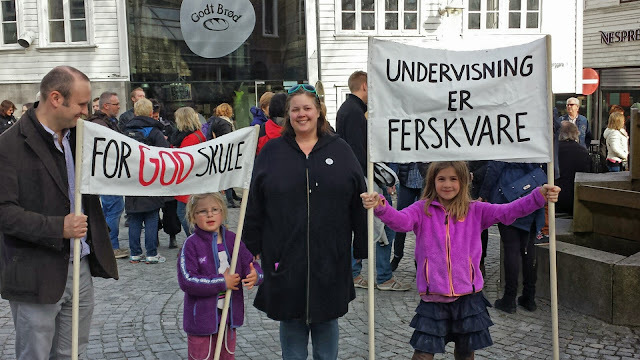 The advantages of having those national negotiating rights, combined with, in general terms, governments that seem to have sought to work with teachers rather than attack them, are clear in the conditions presently applicable in Norway. 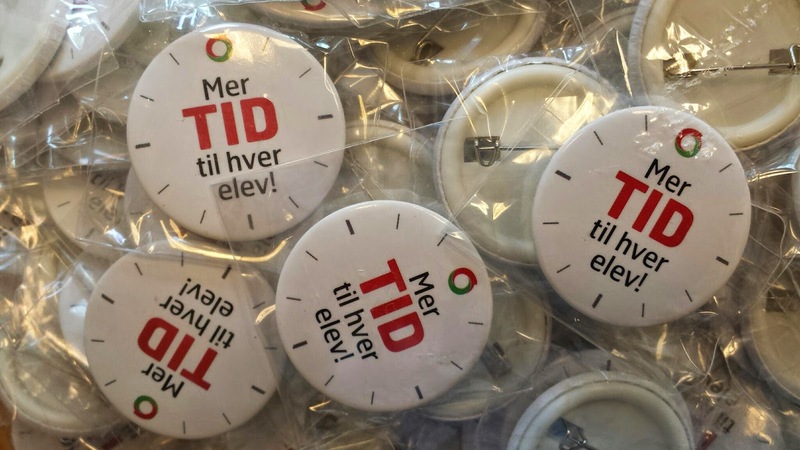 However, politicians' attitudes do seem to be changing as they start to look at reducing public spending to aid tax cuts, worry about the international standing of Norway in the PISA rankings, and start to introduce more of the testing and paperwork that English teachers know only too well. Pay levels are higher, although there is also a higher cost of living. Pay scales depend on both experience and on the qualifications of the teacher, with opportunities being given to staff to train to add additional subjects to their repertoire. The minimum starting salary is around £35,000. A teacher with a masters' degree would start on around £44,000 rising to around £53,000 after 16 years of service. Teachers can retire at 62, although some choose to work for longer (which says a lot about the relative conditions faced!) but pay a lower percentage of their salaries for a higher final pension - 66% of their final salary if I understood correctly. Teachers have contracts which, similarly to England, direct them to work for between 1150 and 1300 hours (depending on sector) but, unlike England, also set down additional non-directed hours to provide a maximum year of 1687.5 hours in total. That equates to around 43.5 hours over 38 weeks of the school year - plus, like England, an additional week for training. In practice, talking to teachers, a weekly limit of 43.5 hours is not enforced. There may be weeks when marking and assessment demands mean longer hours are worked. However, unlike England where 60 hour working weeks are the norm throughout the year, other weeks might see a lighter workload. A critical difference is that, for now, teaching loadings are also set down in the national agreements. A primary teacher would teach for a maximum 26 of the 45 minute periods, out of 28 in total for the pupils. However, if this seems a high loading, it must also be remembered that classes finish around 1 or 2 pm, leaving additional preparation time in the afternoons. The loading would be reduced for teachers with responsibilities. That reduction includes time-off for the school union representative who would also, as far as I could understand, have regular weekly meetings with the Headteacher. In secondary schools, the loadings are lower again, perhaps 19 out of 30 periods. All of these contractual rights to preparation time help reduce overall workload and help ensure that teachers have time to prepare and assess as well as they can to support their students. These details are critical to understanding the threat that has just been made by the employers' organisation at the beginning of the current round of national negotiations. First of all, the employers want to discontinue national negotiations. Instead, they want conditions to be set school-by-school with individual Heads consulting over the loadings that would apply in their school. From bitter experience in England, it's not hard to see how this will undermine the collective strength of the Union and lead to a gradual worsening of conditions as schools under budget pressures start to increase teacher contact time. Heads would also be allowed to direct teachers to cover for absent colleagues, without the additional pay that teachers can earn now if they volunteer to cover. Another proposal is that teachers' working days are increased to 45 weeks, supposedly to match other Norwegian workers' holiday entitlements. However, that would leave teachers in school for an additional six weeks without students being present. Teacher unions have been trying to explain that you can't prepare and plan ahead in full without getting ongoing feedback from classes. They also resent the implication that this amount of additional 'training' is required, as if the employers are questioning teachers' abilities and professionalism. The other implication of this extended working year is that, unless the overall working year of 1687.5 hours is also increased, then teachers would have less working time available every week, leaving less time to prepare and support children. The Union has produced badges with the slogan 'more time with the children, to explain that teachers' time needs to be allocated in the school term, not in the holidays! As with the NUT, the Union are rightly keen to point out to parents and the public why these attacks are a threat to education as a whole. They report that, up to now, press and public support has been generally good - but know that will be tested if extended strike action develops in the summer. Of course, the real danger is that, as in England, teachers end up working longer hours in the working week as well, particularly if their overall loadings are increased. It wasn't lost on teachers that this is also a way to reduce the employers' costs as fewer teachers would be employed to cover the same number of lessons. All of these threats mean that a significant dispute is developing if negotiations fail to persuade the employers to change their minds. Negotiations continue until the beginning of May. During that period, the Union is not allowed to officially take protest actions although, as tonight in Stavanger, individual teachers are instead organising protests to alert the public to the impending threats to education and to bring teachers together in preparation for struggle. If negotiations fail to produce a resolution, teachers are preparing for the possibility of extended strike action, which could begin as early as May 25th. In these circumstances, teachers are clear that one-day protest strikes are insufficient. The union is considering launching an all-out strike for the three weeks to the end of term. Impressively, unions prepare for that possibility at each negotiating round - although usually the dispute is over, say, pay awards, not the whole future of national negotiating rights. Teachers would expect to receive full-pay from the Union for the duration of the strike. However, that may also explain why, along with an impressive ratio of employed officials to local members, teachers expect to pay union dues of around £50 per month - much more than in England. The stage is clearly set for an important battle. NUT members must do what we can to send support and solidarity should teachers have to take strike action to defeat the employers' attacks on teachers and education. 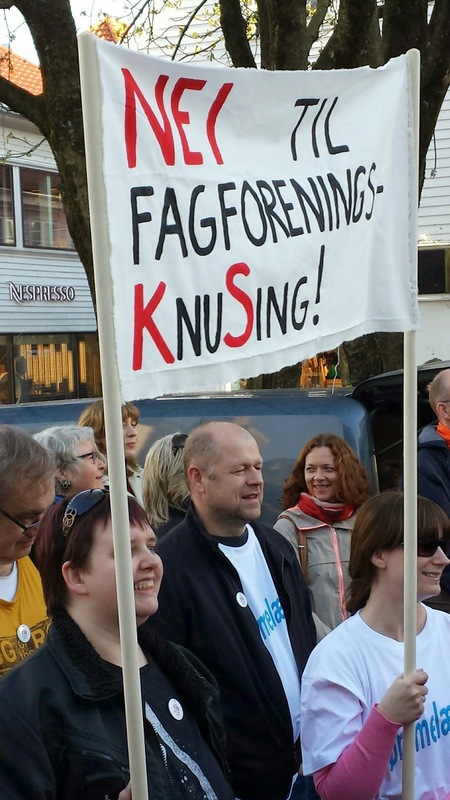 The pictures below are from a rally in Stavanger tonight where I was also able to speak to bring solidarity greetings from teachers in London. Teaching is Fresh Food - i.e. what sense is there to make teachers prepare when students are on holiday? More time with each pupil! Thank you. I am a teacher in Bergen, Norway. We will fight, not surrender. Hopefully there will be better times also in England.